The kingsnake can naturally be found in America, Mexico and southern part of Ontario and Quebec in Canada. They prefer to inhabit humid regions such as wetlands, meadows, lakes, forests and can be found at altitudes up to 2000 meters hiding in burrows and tree stumps. They do most of their hunting in the wild on the ground but can sometimes be found hunting in water. In most cases, these snakes are relatively peaceful and quiet. However, they have very effective means of protecting themselves when they are in danger Such as expelling foul-smelling feces. King snakes are relatively easy to keep and are suitable for beginners. They are considered popular terrarium snakes due to their beautiful colors, their quiet nature, and ease of care. Kingsnakes can reach a body length of 2.5-6.5 ft. (0.8m-2m) depending on the species. There are 8 subspecies of king snakes differing in size, color, and origin. When well cared for in a terrarium, their life expectancy is up to 10 to 30 years. Kingsnakes have a wide variety of brilliant colors of red, orange, black, brown and gray with the combination of white stripes. They are considered one of the most peaceful species of snake with a very calm nature. 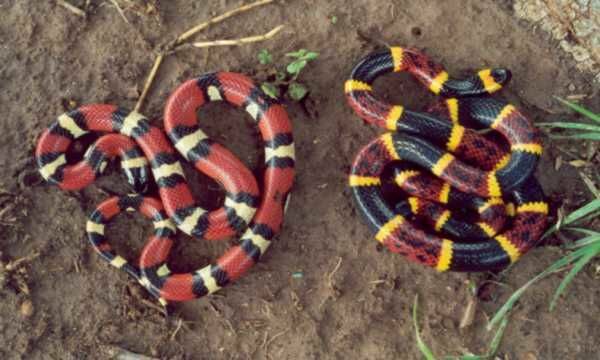 Many subspecies of poisonous coral snakes look very similar to king snakes with black color and yellow stripes ( the comparison is shown below), so they are frequently mistaken as a poisonous snake but they are not. In nature, kingsnakes mainly feed on small rodents, turtles, frogs, lizards, young birds, and eggs. In captivity mice and young rats are the most suitable for feeding. Frozen mice can be given to your snake, but it should never be frozen or cold. The food must be thawed and be at room temperature. If you should feed your snake live animals, it must be eaten immediately. If the snake is not hungry, the animal should be removed and another attempt should be tried again in a few days. When the prey is left running around in the terrarium without being eaten, it can become frightened and attack the snake causing cuts that result in the snake getting sick or dying. Most adult snakes must be fed every 2 to 3 weeks. Young snakes should be fed more often, however, it is important not to overfeed your snake. Some snakes will prefer dead mice, others will prefer them live, and some prefer small or big prey. Some of this depends on the size of the snake, and some will be preference. You will simply have to try out different options to see what works the best. It is also important to provide fresh, clean water at all times. Some snakes swim in the water bowl so it is important that it should be reasonably large. In addition to this, some species of kingsnake require a mist of water regularly to keep the humidity up. The size of the terrarium for the keeping a kingsnake should not be less than 40x20x20” (100x50x50 cm) a larger terrarium is, of course, recommended. It should also be noted, that kings are inclined to cannibalism, and therefore is not good to keep more than one in a terrarium. Since kingsnakes don’t climb, a large floor area should be provided. However, climbing should still be available. A mixture of pine bark and terrarium humus can be used as the ground floor. They can also be kept on a dust-free softwood litter, which binds feces and liquid fast and is very hygienic. The temperature in the terrarium should vary so that the kingsnake can retreat to warmer or cooler places. For digestion, there should be warmer locations in the terrarium. The overall temperature should be between 75–82F (24-28°C) and during the night temperatures should not drop below 66F (19°C). If the room temperature is below 66F (19°C) in the evening, it is advisable to use a heating mat, heating cable or heat accumulator for overnight heating. Depending on the size of the terrarium, the temperature can be reached using a heating spot light, heating mats or heating cables. The artificial day time light should be 12-13 hours in the summer months and 8-10 hours in the winter months. Also, the terrarium can be equipped with a UV lamp, but is not necessary, since the snakes are mostly night-active. The humidity can be from 40-70% and is reached with a terrarium water bowl and occasional mist from a spray bottle. However, the humidity should never be higher than the recommended values, as injury to the respiratory tract may occur. Also, molds and fungi can develop in the terrarium with high humidity. It is best to monitor the temperature and humidity by installing a thermometer. Kingsnakes reach maturity at the age of 3-4 years. After successful mating, the female will carry the eggs for about 6-10 weeks. The pregnancy is clearly visible on the king’s snake, and care should be taken to ensure that the female is in a well-nourished state. The eggs are usually laid in a warm, damp place. In the case of kings, typically in the pit or depression in the soil. In any case, make sure that several places are provided for egg laying. You can also equip terrariums with so-called wetboxes, which are filled with sphagnum moss as some snakes prefer this for molting and egg laying. This will eliminate the annoying searching or digging for the eggs that will cause additional stress for the kings. After laying the eggs (depending on the subspecies and the size of the snake between 4-10 eggs), the eggs should be transferred to an incubator at the latest after 24 hours. The temperature should be between 80-84F (27-29°C). The young will hatch after an incubation period of approx. 55-80 days. The young snakes will be about 8-13” (22-32cm) long when born. After the first successful molt, the young animals can be fed for the first time.